We realise that downtime for any company is associated with a possible loss of income and customer satisfaction. Our aim is therefore to carry out your move as quickly and professionally as possible, with the minimum amount of disruption. 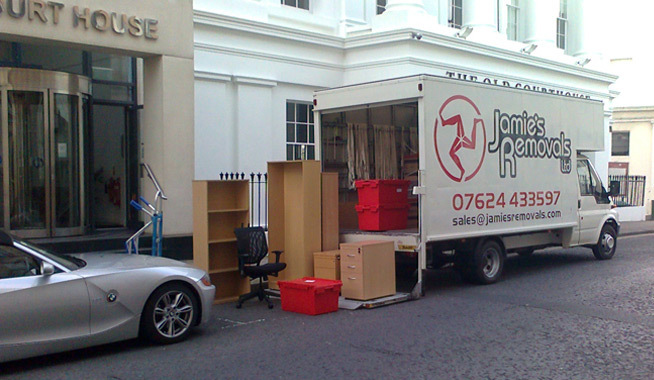 To arrange for a removal quote, please call us on (07624) 433597 or (01624) 870110, or email sales@jamiesremovals.com. We can often arrange a fixed price or hourly rate over the phone or by email, or alternatively we can arrange to visit your premises to assess your requirements. When moving offices, our customers usually prefer to pack all small items, desk contents and files etc into our purpose designed crates prior to transport. We normally deliver these crates in advance of the removal to enable your staff to pack and label their own paperwork etc. We can dismantle and re-erect desks, workstations and racking. We provide crate hire on a weekly basis. We offer safe, secure storage in our modern warehouse.